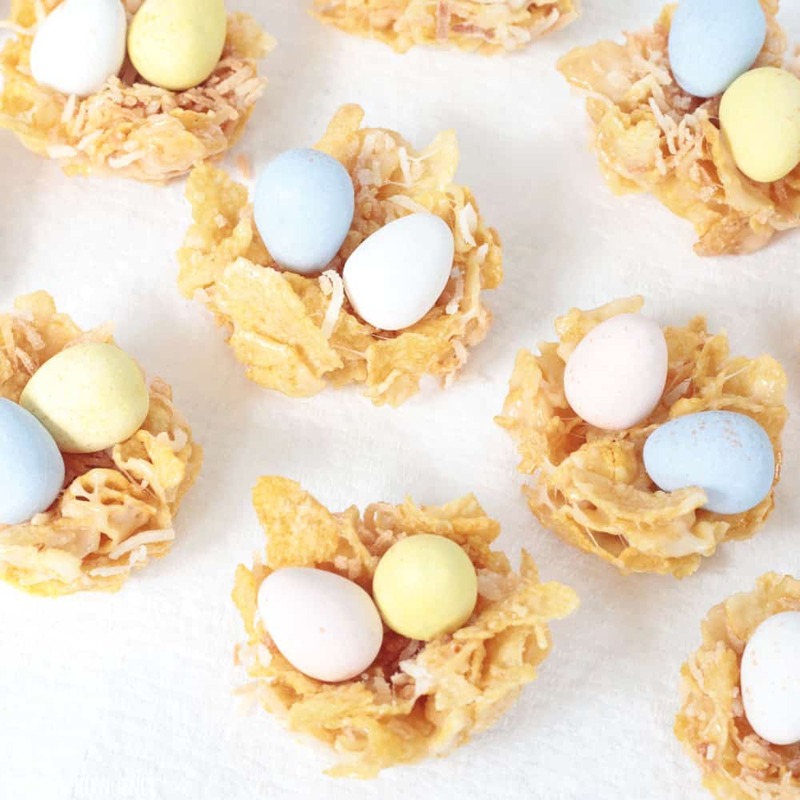 Easter Nests with Cornflakes and Mini Eggs are a fun and easy Easter dessert! My daughter has taken to helping me in the kitchen lately, especially when there are marshmallows involved. She asked me a few weeks ago if we could make Cornflake Wreaths, like we made at Christmas time. 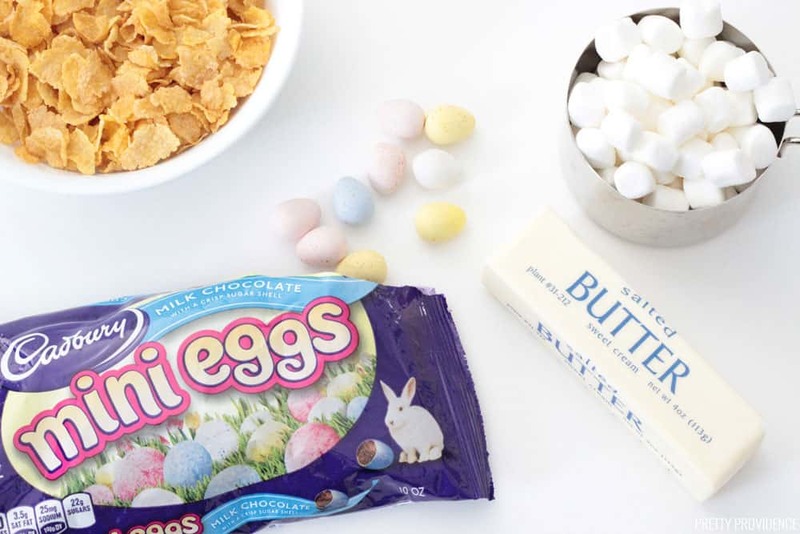 I realized that we could take that concept, and use cornflakes and marshmallows to make little Easter nests with Cadbury Mini Eggs in the middle. I love how these turned out! We also added some toasted coconut to the nests. I love coconut and will add it to almost anything! That is totally optional, though. These are so fun to make and our whole family loved them. My husband actually requests cornflake treats instead of Rice Krispie treats now. The combo of cornflakes and marshmallow is so good! First, you heat the marshmallows and butter and stir until completely melted. Next, you pour the marshmallow mixture over the cornflake cereal and mix well. Spoon the cornflake/marshmallow into a greased mini muffin pan, and shape into nests. Garnish with toasted coconut and Cadbury mini eggs! See? It’s easy, and so fun. They’re the perfect little treat to make with kiddos. 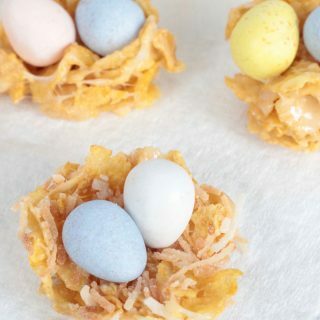 We will definitely be making these Easter Nests again for Easter weekend! We always go to a Crawfish boil the day before Easter, and I know they will be a hit. 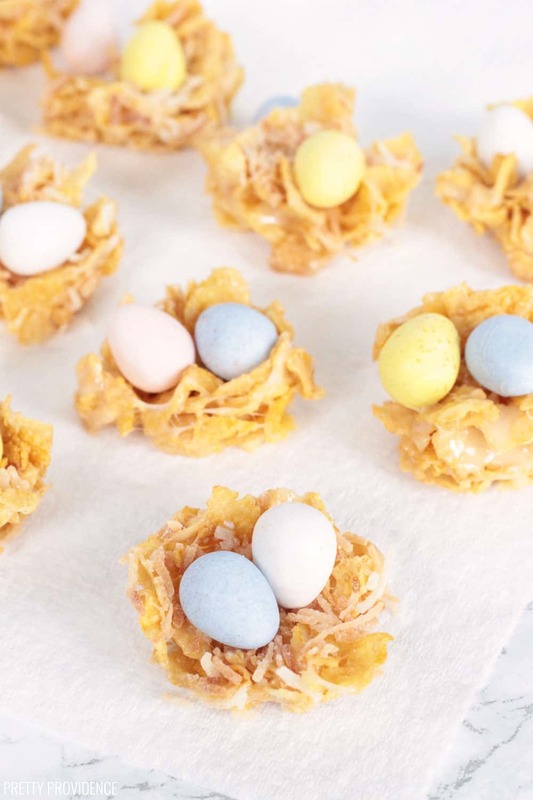 These Cornflake Easter Nests with marshmallows and mini eggs are a fun and easy Easter dessert! Spoon cornflake and marshmallow mixture into mini muffin cups and shape them into nests. 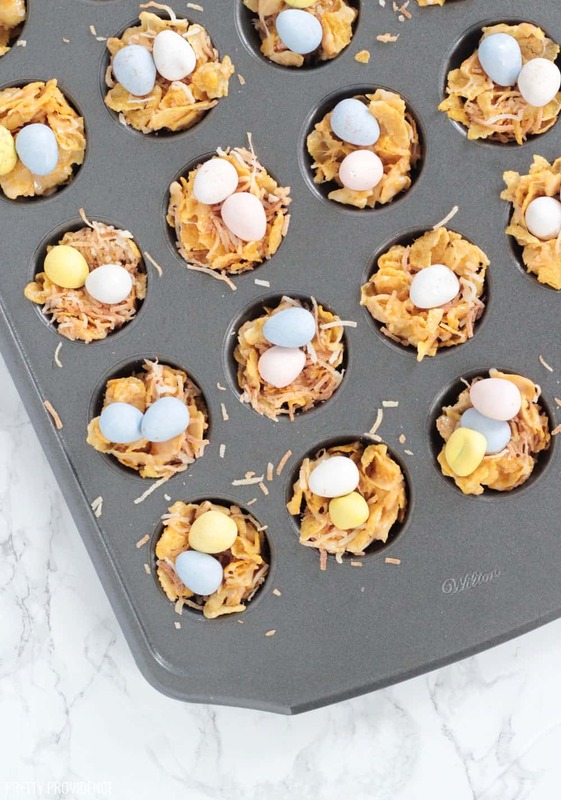 Add Cadbury Mini Eggs and toasted coconut (if using) to the top of each nest. Want more Easter treats? Check out our lists: Fun Festive and Easy Easter Desserts and the 30+ Best Easter Treats!